The perfect housewarming gift or real estate closing gift, this laser engraved wine crate reads "Congratulations on Your New Home," followed by the engraving of your choice. Now comes the best part - select from a grand Champagne or three lush Cabernet Sauvignons, each with their own flavor profile, ranging from plum to mocha to spices. Presented inside this personalized crate, you can't go wrong. One bottle of the Cabernet or Champagne of your choice. For more information on the wine choices, please see the Tasting Notes. One line, up to 15 characters. Enter information to be embossed during the checkout phase of the ordering process. Your business logo can be engraved on this gift. Please contact GiftTree's Business Advisors at 800.379.4064 and we will be happy to assist you. if ordered by 2:00 pm EDT Monday April 22nd. No Place Like Home Engraved Wine Crate is a hand delivered gift. These gifts are delivered by one of our local design centers located throughout the United States and Canada. Same day delivery is available for most gifts when ordered before the cutoff time. The cutoff time for No Place Like Home Engraved Wine Crate is 2 PM in the recipient's time zone. 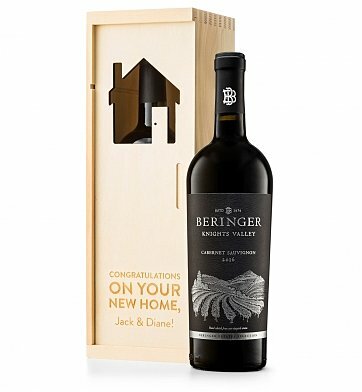 Beringer Knights Valley Cabernet SauvignonOpulent but structured, this versatile wine has supple blue and black fruit notes accented by dark chocolate, roasted coffee and a silky, lingering finish. Istro Cabernet SauvignonSmoked cherry walnut on the nose leads into a satin vanilla mouthfeel and ripe-off-the-vine berry flavor. Finish is long and subtle with excellent Cabernet character. GH Mumm Grand Cordon ChampagneGH Mumm Grand Cordon is the signature of the Maison Mumm. Intense, complex flavors of fresh stone fruits and pineapples, vanilla and caramel that slowly evolve into a long, lingering finish. Kendall Jackson Vintner's Reserve Cabernet SauvignonAromas of lush black cherry, blackberry and cassis draw you in to this Vintner's Reserve Cabernet Sauvignon. Round and rich tannins provide a robust backbone and supple mid-palate. Notes of cedar, vanilla and a hint of mocha linger on the finish. 100% Cabernet gives Istro its silky smooth character from start to finish. Deeply purple colored, Istro offers an exuberant nose of cassis and smoky cherry with hints of vanilla spice, fruitcake and dried flowers. Full, velvety, rich and spicy, it shows great length. The wine opens with deep black cherry, blackberry, and cassis flavors. Intense, round, and well-structured tannins provide a strong backbone throughout the middle and finish. Lush and enjoyable with any of the classic Cab pairings, from steak to caramelized French onion soup. The signature of the Maison, Mumm Grand Cordon has exuberant bubbles and a brilliant, golden color testifying to the vibrancy of this champagne. Lush aromas of ripe peach, apricot and pineapple cascade from the glass, chased by hints of vanilla and caramel, yeast, dried fruit and honey. One sip and Mumm Grand Cordon unleashes intense, complex flavours of fresh fruit and caramel that morph into a long, lingering finish. Select a bottle of Cabernet or Champagne to arrive inside this laser engraved wine crate. Enjoy free engraving below the Congratulations on Your New Home phrase. Includes a complimentary card with your personal message. We purchased this gift for our friends who just retired and moved to a new home. They were thrilled with the box & champagne and said they would save the box in a special place! Thank you!